Russia is big, so when people make mistakes about Russia, they make big ones. There’s no permanent damage to reputation in making mistakes if you can recognize them later on, acknowledge them, learn from them. It also stands to reason that the bigger the mistake, the bigger the concession, and maybe the more valuable the lesson. Take the question of whether Vladimir Putin would fail to win the presidential election in the first round. Starting more or less with Ogilvy in the US in the 1940s, all advertisers know how to read the polls before they design their ad pitches. Reading the Russian polls would have told you for weeks and months that Putin was going to win on the first round. Since he has now done so, with about 64% of the vote, the corollary is that the so-called new media forecasting – inter-telephonic, internet, twitter, facebook, runet, etc. – wasn’t wrong, so much as unrepresentative. Maybe that was less of a mistake than a manipulation. In the outcome, it turns out to be a mistake of action, not just a mistake of fact. It’s a bigger mistake to claim that the outcome would have been different if not for voter fraud. There would be less of a mistake like that in the Russian context if the fraud standard (plus or minus 10% of registered voters) were also applied to the 1996 election which Boris Yeltsin claimed to have won; that much has already been conceded by outgoing president Dmitry Medvedev. Medvedev might also have mentioned the failure of the Russian Constitution to pass the required 50% majority of all voters, until prodded over the edge (58.4% of participating voters) by ballot rigging on December 12, 1993. Why the lawyer president mentioned the second of the big Yeltsin frauds but not the first is obvious – Yeltsin is dead and buried, but the constitution… Well it’s obvious, isn’t it. If you added what the Russia-hating and regime-change media call fraud, say 10%; plus the 8% who voted in favour of Mikhail Prokhorov, one of the biggest fraudsters in Russian economic history; plus the rock-solid 17% to 20% Communist Party vote; plus the 10% for the also-rans on the left, and what do you have? You have almost one-half of Russians who still remain worse off than they were before Mikhail Gorbachev began unravelling their world. You have one-third who for remedy vote left. You have 7% to 10% of the population willing to overlook Prokhorov’s money-grubbing, and everything that went with it, and vote right. But in the centre, you must still count Putin with a majority of the votes. As Boris Berezovskly and Roman Abramovich recently testified in the UK High Court, Yeltsin knew he couldn’t stay in power with the conventional tools, let alone the democratic ones. Look at the red line again — who could? So Yeltsin unleashed his party of thieves and swindlers – with Prokhorov also at their head; and he took the caps off his artillery pieces – against parliament in Moscow, against the Constitutional Court, and against Chechnya. Even then, in 1996, he failed against the Communist Party (officially 41%) and General Alexander Lebed (15%). Ask Dmitry Rogozin, then Lebed’s campaign manager, what he did with the roomful of ballot bags, stuffed with votes for Lebed which were never counted on June 16, 1996. Had Lebed not been bought off , Zyuganov would have won the second round. The right in Russia has been discredited since then. Counting the vote for Yabloko and Konstantin Titov in 2000, it managed 7.3%. In 2004, with Irina Khakamada, the right vote amounted to just 4%. For those about to proclaim new political prospects for Prokhorov, Misha Eight Percent, the record suggests he’s already hit his peak. Had Grigoriy Yavlinsky been permitted to run, he is likely to have taken all of Prokhorov’s votes (Yavlinsky won 7.6% in 1996, 5.8% in 2004); plus the 3% to 5% Against-All vote, which has been disallowed since 2008; plus Sergei Mironov’s vote this time (around 4%). That hypothetical adds up to 17%. No matter how you count the right, the left, the Against-All, and the fraud, Putin still commands an unrigged majority of Russian votes. That noone in Western Europe, North America, or the Australasian democracies can demonstrate a comparably sized mandate is almost beside the point. The chart demonstrates that in the run-up to this Sunday’s election, the combination of the usual Russian market factors (oil price, etc. 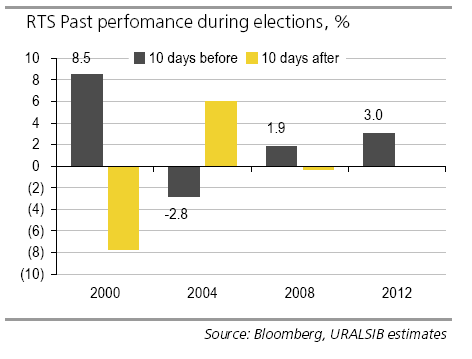 ), plus political uncertainty, generated an inflow of funds and rise of stock market values that are bigger than have been recorded since the pre-election period of 2000. Can people putting their money where their mouths are have been so indifferent to the tweeting of the devices inside their breast-pockets? The answer is yes. So, if the RTS index continues upward after the poll result has been declared, and Russian stock prices rise at better than 1.9%, ergo — the conclusion is obvious: Putin’s re-election conveys the same meaning to people with money as to the majority of Russians without it – he stands for the hope for something bigger and better that requires more stability and security than anyone else in Russia can pretend to deliver. And that’s the test – can Putin deliver a restoration of the Soviet level of living standards, health and social welfare which Russians have been waiting for? Can he – no, will he end the corrupt system of income inequality and concentration of wealth which has deprived them for all these years? No need to answer these questions with forecasts from opposition spokesmen of a mass exodus offshore of those with tweeters in their breast-pockets; or on to the streets of Moscow and St.Petersburg once the spring thaw starts. What counts is what the new president can deliver, and how quickly. Go back to David Ogilvy, a misfit at home in GDP-contracting England; who made his pile in the US during the GDP-acceleration years; and liked to show it off in a French chateau from the fairy-tale past. Ogilvy, right at home with the oligarchs of his day, believed it was a waste of his time trying to sell something to people who couldn’t afford to buy it. That’s why he made his fur-hat mistake about the Russians. It’s different now. Ogilvy’s admen are lucratively established in Moscow selling things most Russians can’t afford, but making a hefty profit nonetheless. 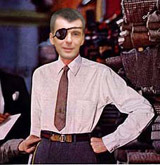 But could Ogilvy, who sold shirts by offering the chance to emulate a gentleman with a pirate’s eye-patch, make the image of Russia’s pirates equally sellable? False consciousness, which Ogilvy’s salesmanship epitomized before 1991, has been out of fashion in Russia , though Prokhorov is spending enough to underwrite its comeback. Money still talks; and so does lack of money. The party of those who want much more voted for Prokhorov; they also talk the loudest on Ekho Moskvy radio and in the Financial Times. The party of those who want enough voted Communist. 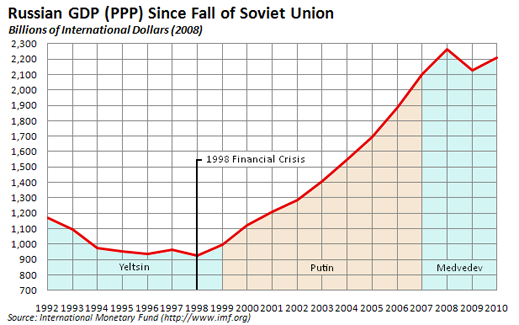 Those who want their fair share think Putin can deliver the growth and equity required. They may be right about that. Maybe not.